Click on the language selection located top right.Select your preferred language, country of origin and preferred currency. if not the above, please email us a screenshot of your registration and your full name and email address, we will setup a valid account for you. There are several methods to finding your item(s). You can navigate via our search engine or by category or through our shopping themes displayed on the homepage. We have integrated five shopping malls and one auction mall (all from Japan). To shop at these malls, simply click on any of our recommended shopping tabs above the search engine. You can refine your search using the 'Advanced Search' option. As you narrow down your search, you will be assisted with suggested key search terms to help you find your desired item(s). For more details, please click here. To reduce your bank transfer fee, we advise you to place deposit that covers both payments. We also recommend using the auto-system checkout feature. In order to bid and buy, you will be required to deposit an amount that is at least equal to your planned purchase or initial ceiling bidding price. For more details, please refer to 1st Payment. Our flexible payment options enable easy and safe transactions. For international transaction, we recommend PayPal. Below are the options currently available for specific regions, For more details, please refer to payment options. You might want to take a look at our different VIP Membership award programs to learn more about our benefit programs, discount coupons and vouchers. For more details, please refer to service fees. 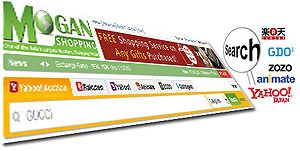 Mogan Shopping enables real-time bidding on (Yahoo! Auction) and buying at (Rakuten, Yahoo, ZOZOTOWN, Animate and GolfDigest) with convenience and protection. Our experienced customer service teams are on-hand to assist you every step of the way. You can continually shop for a period of 48 hours per session to group buy your items to lower your shipping delivery fee. For details on how to bid, please click here or click here for details on how to buy. Please also be aware of the restricted items on international shipping. In case you were unable to find your required item(s) from Mogan Shopping's recommended stores, you might be able to find it from our shopping mall directory ('Other' tab) located above the search engine. To shop at these stores simply fill out our 'Buy For Me' request form via: My Account > Buying > Buy For Me' along with a few other details and we will handle the rest once we receive your request. For more details, please click here. Enter item name, quantity, price (in Yen) and any special requirements. Submit and deposit your funds into your Mogan Shopping Account. Once you are ready to conclude your shopping session (of up to 48 hours) you need to checkout to activate the order process. There are two ways to do this, auto-system checkout or manual checkout (2 times). Both of these options are found in your 'My Account' under Order Info, whereby you can check your cart before clicking on the 'Checkout' button. For more details, please click here. Our international shipping operator is mostly through EMS. Although we cannot guarantee your items will arrive in pristine condition, we do however, offer a repackaging service for greater protection and peace of mind. We operate with several leading shipping partners which provide reliable and secure service so you can have greater peace of mind that your item(s) will arrive in pristine condition. For more details on our shipping operators, please click here. This is the place where you can manage all your requests, purchasing activities and fees (international/ local shipping, VAT and related costs). Furthermore, you can notify us if you need additional packaging (particularly for fragile items), or send your item to a different specified address. For more details please go to About My Order and My Account. At each major stage of your order process, we will send you an update into your Inbox: Status Alert Messages within your 'My Account > Overview'. You can also track the shipping timeline via EMS. For more details, please click here. If you need assistance you can contact us via help.